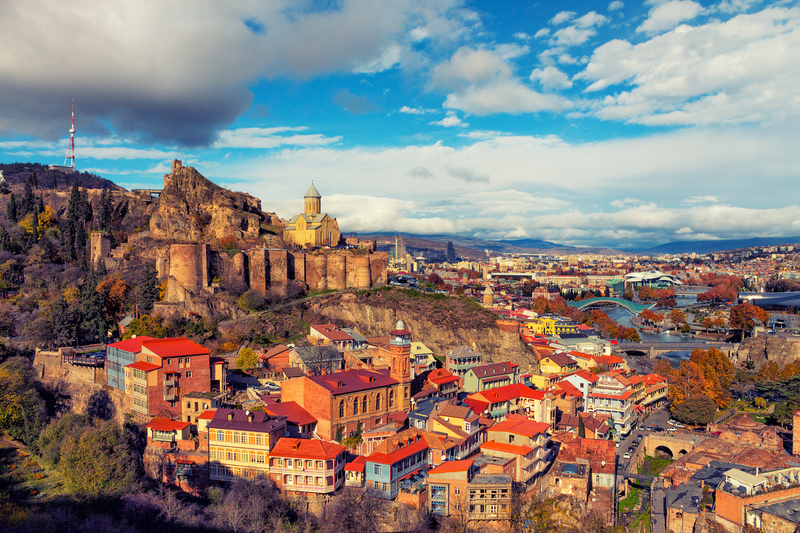 If you're looking for a trending international destination for your next getaway, consider Tbilisi, Georgia. According to Conde Nast Traveler, Tbilisi was one of the best places to visit in 2018. The city lies on the banks of the Kura River, at the crossroads of Europe and Asia. Tbilisi is full of historic architecture, museums, theaters and universities, along with a growing nightlife and a delectable food scene. Fortunately, there are plenty of relatively inexpensive flights between New York City and Tbilisi, at least according to travel site Skyscanner. Here's a list of flights, hotels, restaurants and local attractions in Tbilisi to get you started. The cheapest flights between New York City and Tbilisi are if you leave on March 31 and return from Georgia on April 10. Turkish Airlines currently has tickets for $599. There are also deals to be had in August. If you fly out of New York City on August 14 and return from Tbilisi on August 28, Qatar Airways can get you there and back for $641 roundtrip. To plan your stay, here are some of Tbilisi's top-rated hotels, that we selected from Skyscanner's listings based on price and customer satisfaction. For an all-around top recommendation, consider The Radisson Blu Iveria Hotel, Tbilisi. The hotel has a 4.5-star rating on Skyscanner, and rooms are currently available for $239. There's also the 4.3-star rated The Tbilisi Marriott Hotel, which has rooms for $250/night. A third option is the Rooms Hotel Tbilisi. With a five-star rating on Skyscanner, the hotel is one of the most luxurious in the city. Don't miss Tbilisi's food scene, with plenty of popular spots to get your fill of local cuisine. Here are a few of the top-rated eateries from Skyscanner's listings. "This was our first experience with Georgian food and it was exquisite," wrote visitor Mitchell. "The coffee here is great, but what I really love is the location right on Rustaveli Avenue. Try to grab a seat outside and enjoy the amazing people watching," wrote reviewer Robert. Not sure what to do in Tbilisi, besides eat and drink? Here are a few recommendations, provided by Skyscanner. "There are cafes and restaurants around the tower, so get a seat on a patio and enjoy the view," wrote visitor Jenny. Then, there's the National Botanical Garden of Georgia, with five stars from five reviews. "This is a small but pretty botanical garden in the heart of Old Town," wrote visitor Maria. Lastly, spend some time at The Sioni Cathedral. It checks in with 4.9 stars from 16 reviews. "This is an amazingly grand cathedral, beautifully built and with a very big staircase leading to it," wrote visitor Mitchell.